Osama Bin Laden's personal diary, video of his son Hamza's wedding and documentaries about himself were among files found on the al-Qaeda leader's computer, the CIA has revealed. Nearly half a million of the files have been released, the fourth such tranche. Bin Laden's computer was taken during the 2011 US raid in the Pakistani town of Abbottabad in which he died. Some contents are being withheld over security or because they are corrupted or pornographic, the CIA said. CIA director Mike Pompeo said the release included 18,000 documents, 79,000 audio files and images and more than 10,000 videos which shed light on the "plans and workings of this terrorist organisation". 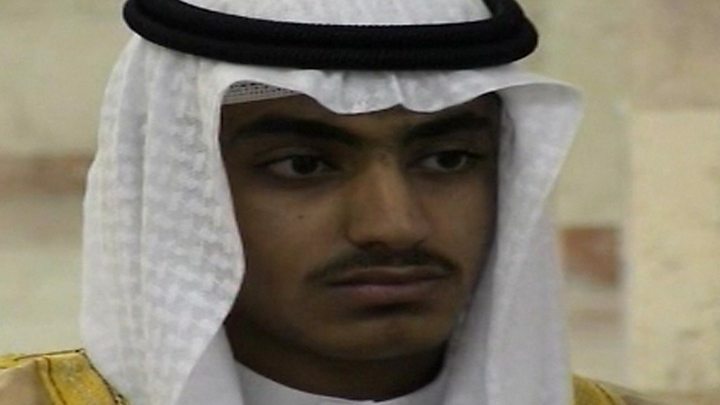 What do we learn about Bin Laden's son Hamza? The videos include a clip from the wedding of his son Hamza - thought to be his favourite son. Hamza has been mooted as a future al-Qaeda leader. Analysis of objects shown in the video suggest it was filmed in Iran. Previously only childhood videos of Hamza had been publicly seen. Bin Laden himself is not seen in the video but one of the wedding attendees says that the "father of the groom, the prince of the mujahideen" is joyous at his son's marriage and his joy will "spread to all the mujahideen", AP said. Other senior al-Qaeda figures can also be seen in the footage, according to analysts from the Foundation for Defense of Democracies (FDD) who have been studying the newly released files. The militants include Mohammed Islambouli, the brother of the man who killed Egyptian leader Anwar Sadat in 1981, the FDD says. In recent years al-Qaeda has released audio messages from Hamza Bin Laden threatening the US, calling for the Saudi government to be overthrown and encouraging jihadist action in Syria. An image of him as a boy was superimposed onto a picture of the New York World Trade Center on the recent anniversary of the 9/11 attacks. What was in Bin Laden's video collection? The al-Qaeda leader had a series of animated films on his hard drive including Antz, Cars, Chicken Little and The Three Musketeers. There were also several YouTube videos, including a viral clip from the UK called "Charlie bit my finger" and videos about crocheting, including one entitled "How to crochet a flower". The role-playing computer game Final Fantasy VII was also on the computer. Bin Laden also had copies of three documentaries about him, including one called Where in the World is Osama bin Laden, as well as National Geographic documentaries including Kung Fu Killers, Inside the Green Berets and World's Worst Venom, AP reported. The al-Qaeda leader lived in the walled compound with several members of his family. Three other men - one of Bin Laden's sons and two couriers - and a woman were also killed in the raid. What do the other documents show? The 228 pages of Bin Laden's handwritten notes cover an array of topics, including the 2011 Arab uprisings, which Bin Laden did not see coming, the FDD says. The documents also show that Bin Laden was still in charge of al-Qaeda up until his death and was in regular communication with subordinates around the world. He spent time trying to understand US strategy in Afghanistan and Iraq and had parts of the investigative journalist Bob Woodward's book Obama's Wars translated for him. Another document written by a senior militant examines al-Qaeda's relationship with Iran, according to the FDD analysts, saying that despite disagreements their "interests intersect", particularly because they are both "enemies of America". Last year the US state department said Iran had since at least 2009 enabled al-Qaeda to move funds and fighters through the country to South Asia and Syria. The CIA said the released documents also gave an insight into ideological differences between Bin Laden's al-Qaeda and the more recently formed so-called Islamic State (IS) group, as well as disagreements within al-Qaeda itself over tactics. What was on Bin Laden's bookshelf?